Monogram faux suede handbag tote. A new winter look in British tan! Cutting edge fashion. Soft suede material is smooth with long tassels on each side. Inside has a separate middle zipper compartment, zip and open wall pockets for organizing your essentials. Incredible style comes with this over the shoulder tote or use the extended strap for a cross body carry. 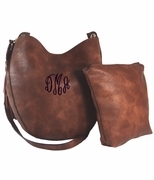 ADD OUR NEW ACCENT MONOGRAM, PLACED BETWEEN THE HANDLES APPROXIMATELY 1" HIGH. 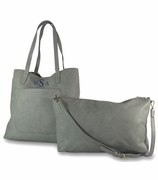 Suede handbag tote measures 12"H x 13"W. Side tassels are length of tote.